the Big Park of Fennachrochan, the shallow wetland glen to the east of the township, offering good grazing (and some potential arable land on the surrounding ridges). It is said to be where islanders hid their cattle when raiders arrived. Both areas appear to have been unpopulated until the 19th Century, although the ridge to the west of the Big Park was occupied in the Iron Age. 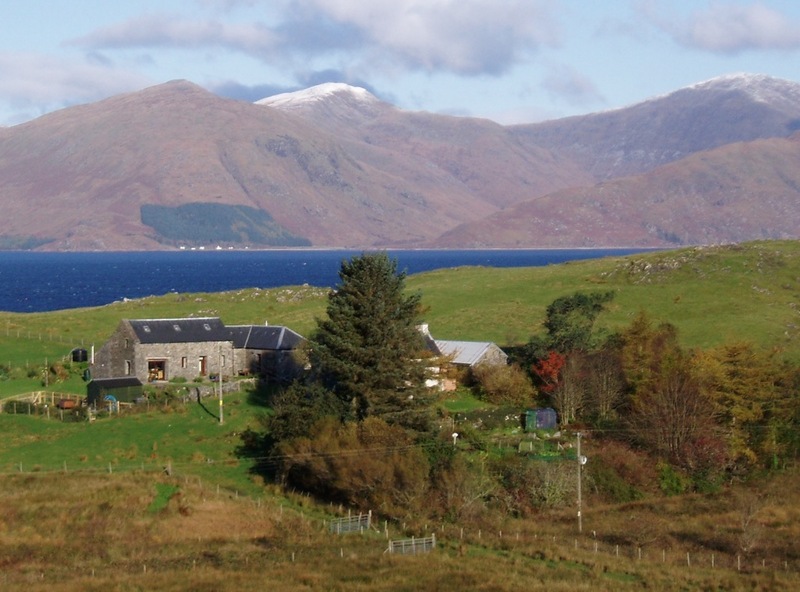 Set in an enclosure of 4 acres of flat land, Park Dun commanded a view over Loch Linnhe to the north and west. It is not clear how these two areas were rented out for grazing by the Airds Campbells. Airds’ resident tenants in the late 18th century were concentrated on the Laggan area where the glaciers had dug into slate rather than limestone, and deposited a thick layer of clay and silt on the shore. 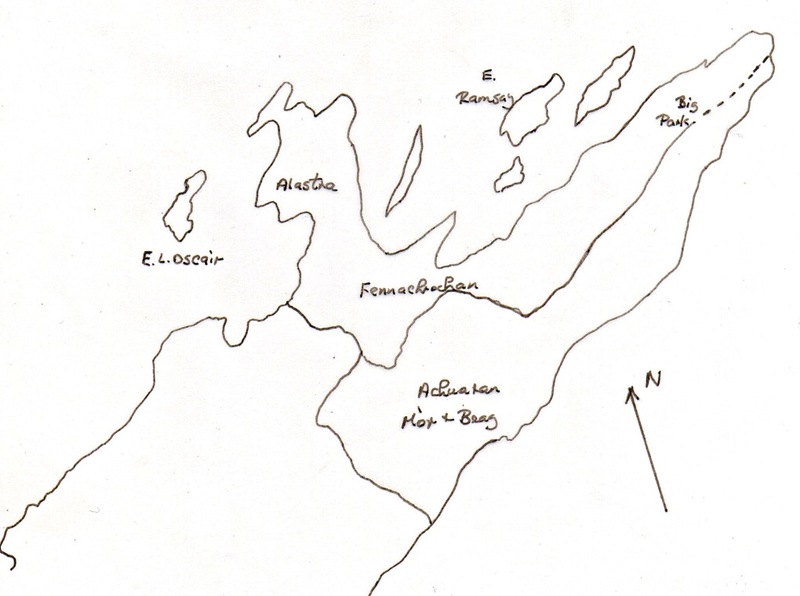 William Roy’s Military map of 1750 does not show any buildings on the township of Fennachrochan, although the Allt a’ Mhuillinn running into the bay through today’s crofts suggest that there was a mill at some time. The Parish Record births from 1766 give glimpses of the inhabitants but, after 1820, there is confusion in some documents because the inhabitants of the crofts tend to be lumped together with Port Ramsay and Park – for example in the List of Church Communicants of 1834. It is possible that the Argyll papers may give further information. The History of Port Ramsay is covered separately in Part 3. By the time that Port Ramsay had been fully established (c1820), the other inhabitants of Fennachrochan lived either on the three Laggan crofts or on the new farm at Park (see below for the developments at Park). The qualified voters for the township in 1836 (i.e. the principal tenants) were Duncan Black, Big Park, and Dugald McCorquadale, Fionkrockan. The list of births at Fennachrochan in the Parish Records presents a picture of a very fluid population in the second half of the 18th century. Between the start of the records in 1766 and 1779, there were 15 married couples having a total of 23 children. Of these couples, only three had more than one child: Hugh and Margaret McColl (4, 1773-9), Solomon McColl and Katharine Campbell (4, 1771-7) and Archibald and Flory McIntyre (2, 1770-2) and even these couples had children elsewhere on Lismore (Achnacroish, Bachuil, Baleveolan and Tirlaggan). The township appears to have been a fluid community of around four family units, actively exchanging with other townships. It is unlikely that they would have formal tacks for their land holdings. The population stabilized to a certain extent between 1780 and 1800, with two families of McColls continuing into the 1800s and Solomon McColl returning to Laggan. 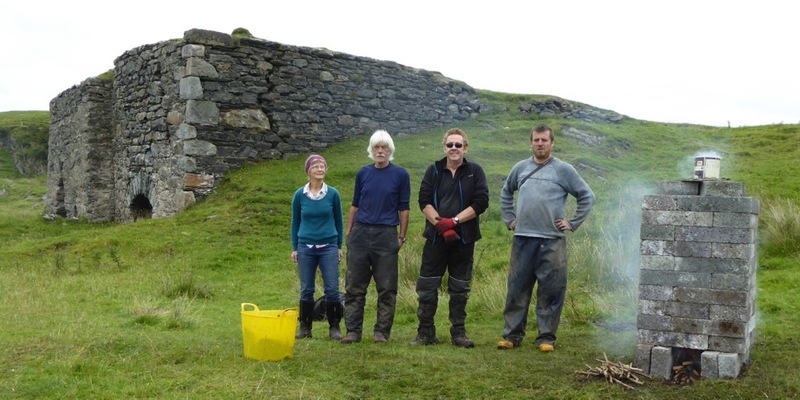 Altogether seven couples had nine children at Fennachrochan. The record for 1800-1819 shows that Laggan had, by that time, been divided into the three crofts that are familiar today. That there was greater stability (possibly with the issue of written tacks) is shown by the fact that only four couples had children in the period: John Campbell and Cathrine McColl (1800, 1806, 1810); Duncan and Anne Black (1806, 1808, 1810, 1812, 1819); Neil and Mary McPhail (1807, 1809); and John and Mary McColl (1811, 1814). Neil McPhail, son of the Neil McPhail who had been present since at least 1807, with a croft of 2 acres (rent £3). This was inherited by his sister Betty and remained in the McPhail family till the end of the century. Archibald Campbell (absent at the 1841 census), son of John Campbell (born Laggan 1800) who crofted 3 acres (rent £3) up to 1881. Dugald McCorquodale with a much larger land holding (extent and location unknown, but possibly including the land surrounding the modern Baker house – to the right in the image above), rented at £45. By 1851 he was a cottar in Baligarve. James Hastie, Glaceriska, Appin (probably a relation of Peter Hastie, Port Ramsay) who paid £47 in rent. Another member of the Hastie family, William, was ground officer for Airds (see Napier Report). It is likely that these three tenants grazed livestock on Alastra. Rev. Gregor McGregor, parish minister, who grazed sheep on Eilean Loch Oscair (locally known as Eilean na Mhinistear) for £4 per annum. This was in addition to the land he rented on Port a’Charrain. The 1858/59 County Valuations and the 1861 Census confirm the continuation of the McPhails, the Campbells and Rev. McGregor. By 1871, the Livingston brothers, Duncan and Colin, arrived from Balure to the croft the family still occupies; but it was not until 1891 that John McCorquodale (The “Baron”, captain of the Lady Margaret smack) brought his wife Sarah and their family to Laggan. and, further up the slope there is a cottage with a gable hearth. All of this points to a significant lime burning enterprise, although the cottage could be simply a bothy for workers. It is possible that this industrial complex was set up by Campbell of Airds, in conjunction with the kilns at Park. In the 1871 OS map it is already referred to as “old”. Further research in the Argyll archive at Inveraray may reveal its history. There is one more stone building to the north of the peninsula, possibly only a livestock enclosure, and no sign of other occupation, but there are traces of rig and furrow on the steep, grassy, south-facing slope. It would be an arduous business to cultivate this land, bringing tools over from Laggan. The 1815 birth of Cathrine to Duncan and Sally Black at Big Park provides the first evidence that there was a dwelling house at Park. In 1834, Duncan was paid for supplying lime to Campbell of Barcaldine, showing that the Park limekiln was in operation. He was a substantial tenant, one of very few registered to vote in parliamentary elections. According to parish records, Hugh Carmichael and Mary Black were resident at Big Park in 1831. 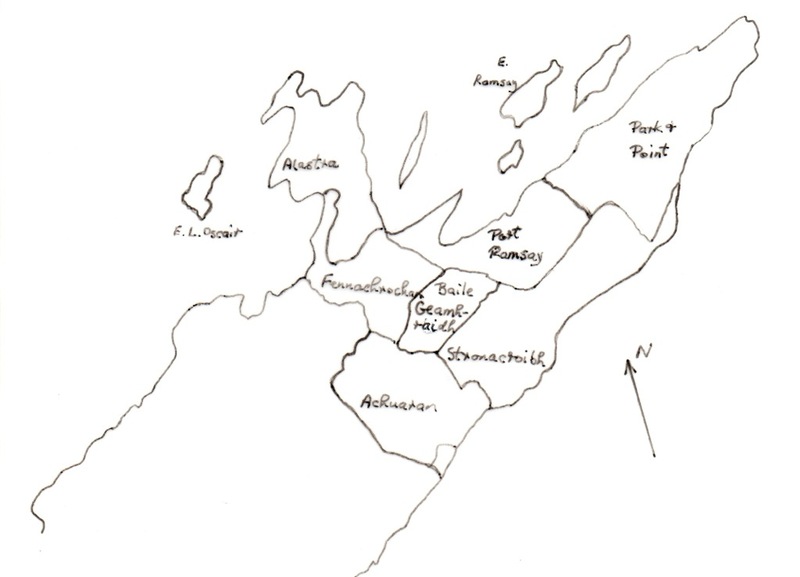 By 1841, Duncan Black had been replaced by Dugald (55) and Mary (50) Carmichael, who had moved to Park from Baileouchdarach, with a household of eight, including their eldest son Neil (36). The lease for the farm included the management of the limeburning. 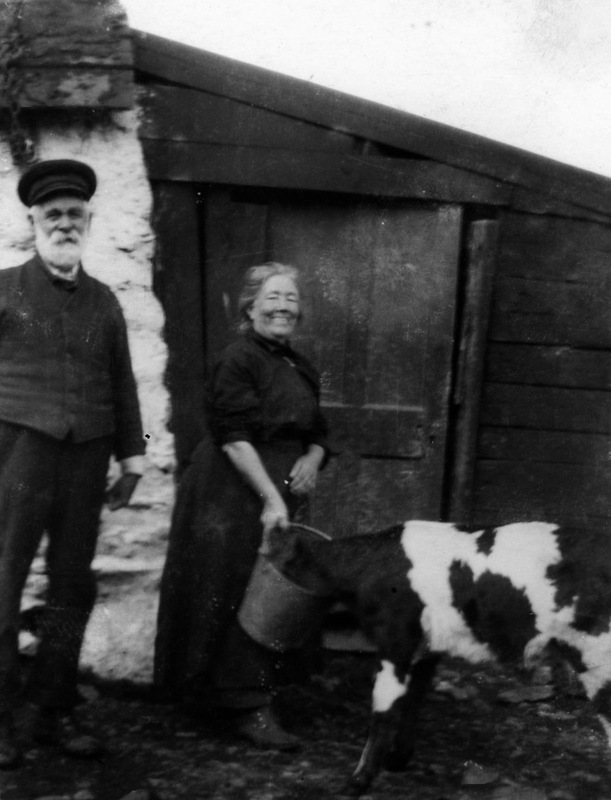 In 1851, Dugald (67) is described as a farmer of 48 acres (rent £88), employing two men, and the crowded household included two grown up sons Neil (36) and Malcolm (22, described as a ploughman – first prize winner in the 1855 ploughing match), as well as Neil’s wife Mary, four grandchildren and a herd. Dugald appears to have died before 1855, and the estate permitted Neil to succeed his father. In 1861, aged 40, he had 42 acres, employed a ploughman, two farm labourers and a dairymaid, all resident in a three room house. We know quite a lot about the Carmichael years of farming at Park because of the testimony given by Dugald (junior) to the Napier Commission in 1883. Park had not been an arable area and it fell to his grandfather Dugald to drain and cultivate 25 acres; the fact that Park was chosen as the venue for the second ploughing match of the Lismore Agricultural Society in 1854 shows that the work had been thoroughly done. It is likely that the piles of cleared stones that are a feature of the land next to the Dun date from this time. The rent was raised to £92 when Neil took over, eventually rising to £100. He built over a mile of drystone dykes and, under the direction of the estate factor, introduced a rotation of oats, potatoes, oats, ryegrass and pasture. This was a cause of dispute with the factor as Neil wished to grow oats more frequently, and reduce the area of grass. Nevertheless, the Agricultural Society minute book shows that Neil was a leading farmer, serving on the “committee of management” and winning premiums for oat crops, cattle and horses. A Scotsman estate advertisement of 1843 confirms that the “Limeworks in Fennachrochan were in full operation” and receipts for lime shipped to Oban in 1862 show that Neil was managing the lime burning at the Park limekins. There is no documentary evidence for the building of the second kiln, nor for the slated cartshed and stabling for four horses next to the dwelling house (the nucleus of Park Steadings – the byre and dairy were built later in the century). Both are built to a high standard, with Etive granite quoins, suggesting investment by the estate, possibly by Alexander Haig, the landowner, around 1860. Later, the limeworking was sublet, with the agreement of the estate. Neil built a new house for his family around 1868, expanding his accommodation to five, later six, rooms. With some alteration, this is Park Farmhouse today. Shortly after his death, aged 66, in 1879, the family rebuilt the barn to the north of the house. In 1881, Mary (widow, 56) is described as a farmer of 70 acres, 20 arable, with two sons and a son in law at home (Dugald 30 and Duncan 20; and John McGregor 25, farm labourer, married to Mary Carmichael). In spite of the presence of three capable men, and a strong tradition of good husbandry, the estate decided to evict the Carmichaels, as their lease had expired. It seems that, as early as 1881 (see Part 2) Park was to be joined to Point Farm. Dugald Carmichael and his mother moved to a cottar house on Balimakillichan but were soon away from Lismore. They were very bitter about how they had been treated, including the loss of investment in their house and barn, which reverted to the estate. John and Mary McGregor were able to secure a croft at Port Ramsay. Martin C. & Martin P. (2006), Lismore Limekilns – Unpublished Report for Historic Scotland. Copy in the Lismore archive. Airds, 1839/40. Copy in the Lismore archive. Park Lime Documents 1862. 1. 17 May. Shipping receipt for lime in barrels from Park Lismore. 2. 14 June. 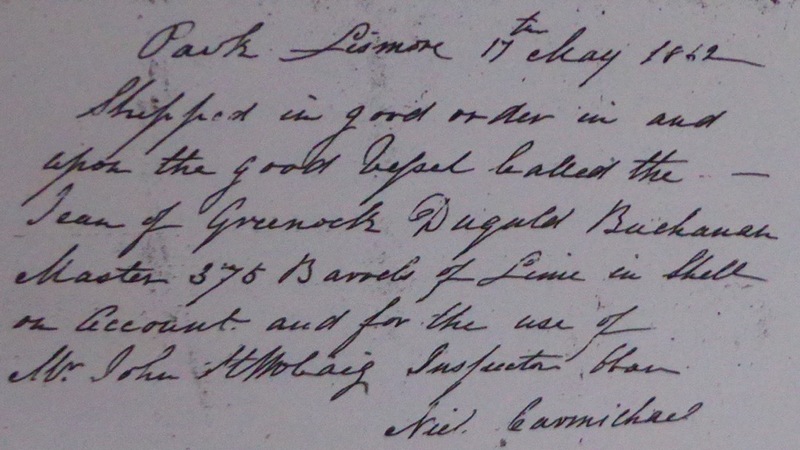 Receipt for 530 barrels shell lime from Park, Lismore. Copies in Lismore archive. Register of Voters for Parish of Lismore, 1836. Copy in the Lismore archive. Roy W. (1747-55). 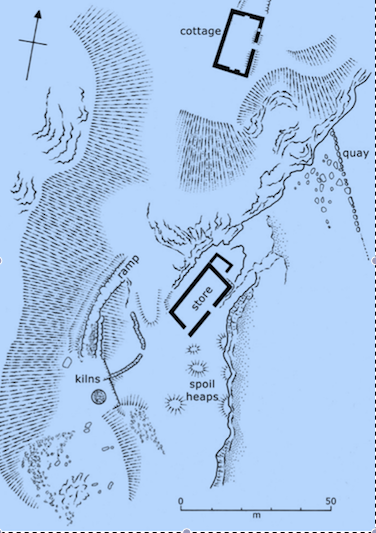 William Roy’s Military Map. Royal Commission of Inquiry into the Condition of Crofters and Cotters in the Highlands of Scotland (18884). (Napier Commission). Scotsman 21 June 1843. Advertisment of land for sale: Frackersaig, Clachleac, Balnagown & mill, Killandrist, Baligarve, Balure, Tirfuir & island, Achuran, Fennachrochain and Port Ramsay. Transcript in Lismore archive. Valuation of Argyllshire, 1858/9 (Transcript in the Lismore archive).